Creative Valentines for the Uncreative | Kids in T.O. Personalized Valentine’s Day Cards by Sunny Rhino Designs. Every year I get sucked into picking up a pack of cheap, cute and often picked-over store-bought Valentine’s Day cards for my kids in TOw to sign and send to classmates. No more. This year I’ve asked two creative and talented Toronto moms to offer up their Valentine Card solutions that will save you time and money. And — you don’t have to have a single crafty bone in your body to dole out these one-of-a-kind Be-Mine wishes. Ally Tripkovic is a Toronto designer creating beautiful and colourful modern and playful prints on her online store Sunny Rhino Designs. 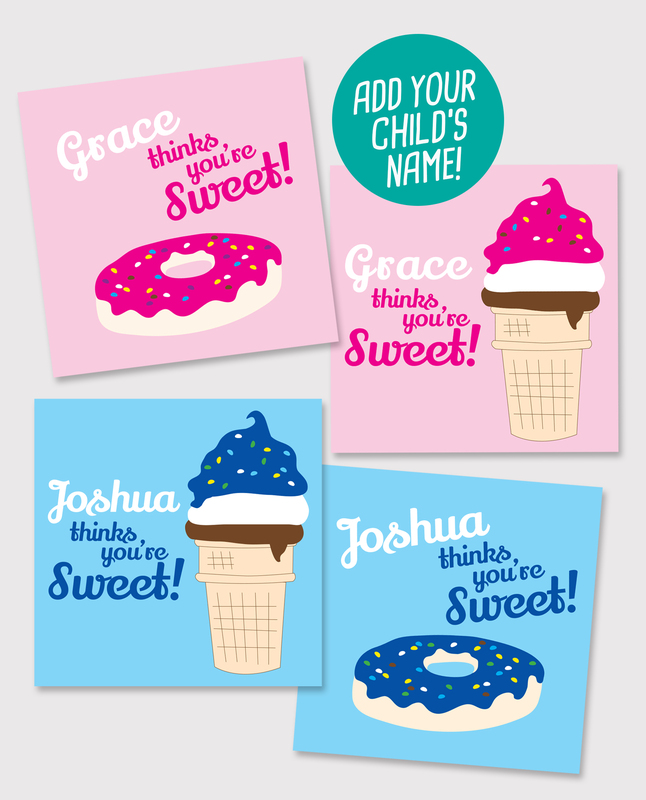 She’s got you covered for Valentine’s Day – she can personalize cards with your child’s name. She also has some free printables available online. So cool and so easy – either print them at home or go with a thicker stock of paper and print them at your local print shop. By Ellie’s daughters in TOw. Toronto artist and illustrator Ellie Arscott inspires her two girls to create their own Valentine’s Day cards. She shrinks their drawings in photoshop then prints them as little one-sided cards. 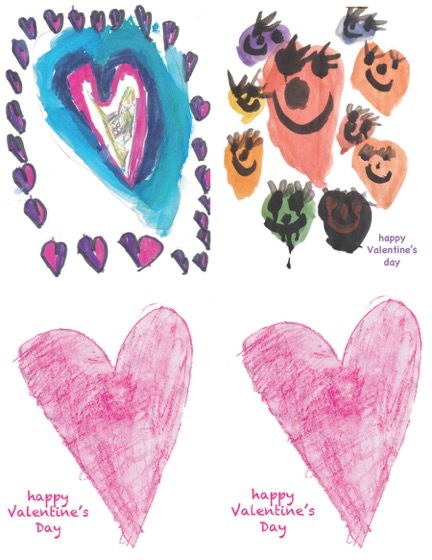 (No access to photoshop – divide a sheet of paper into smaller cards, get the kids to fill each as they wish, and colour photocopy the entire page.) Get your kids to sign their names on the original to cut down on extra pen-work when addressing the cards. One of my favourites by Ellie (not her girls) is this snow angel heart. Ok, some of us actually like a good craft. Have you ever melted crayons? Me neither. But this appeals not only to my creative side but to my eco-conscious efforts. (Traditional crayons are sticks of paraffin wax, a by-product of petroleum or crude oil that is not biodegradable.) So recycle your broken bits into hearts and regift for more colouring. I found this fun DIY guide from Our Best Bites. Of course, don’t forget to add the ‘u’ in colour. Even easier and equally beautiful, Ontario blogger Happy Hooligans shares her washable markers over crayon technique on CBC Parents. I love her suggestion of using the white crayon to write a ‘secret message’ and including a marker with the card for your Valentine to colour in.